Give a square enough acid, and three hours later, he’s barefoot in the grass, weeping over a daffodil. A few hours after that, he’s jumping around like George Bailey at the end of It’s a Wonderful Life, renouncing a life driven by money and power for one centered around love and kindness. 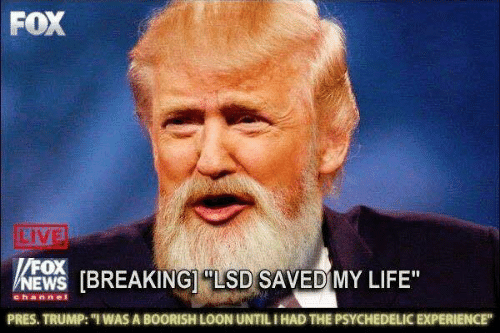 The psychedelic experience is so powerful, goes the cliché, that it dissolves and redeems any ego placed in its cosmic grace, even oversized and diseased ones like Donald Trump’s. The Bearded Trump meme did more than riff on a vintage hippie trope. By taking the president as its subject, it touched on a theory of radical social change dating to the West’s first postwar encounters with hallucinogens. This is the idea that the widespread and structured use of psychedelics, including by presidents and prime ministers, could enlighten and transform a civilization hurtling toward thermonuclear holocaust and ecological collapse. It is rooted in a belief that the crisis of the modern world is a spiritual crisis and sees psychedelics, also known as entheogens (meaning “God-containing”), as potential accelerants in the construction of a more balanced, more soulful society built for survival. The ultimate molecular shortcut. Alle teksten op deze website zijn door Dr. Psylo gelicentieerd onder een Creative Commons License.